City’s presence highlights the University's involvement with the global aerospace industry. 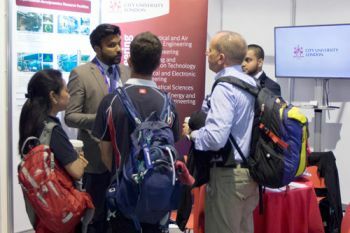 City University London’s Mechanical Engineering and Aeronautics Department stand drew the attention of visitors to the 2016 Farnborough International Airshow. During Futures Day on 15th July, many school-aged students visiting the Airshow had an opportunity to see several models displaying City’s instrumented wind tunnels. City’s 4th Year undergraduate Aeronautical Engineering students also showcased an aircraft model which they built as part of their entry to the American Institute of Aeronautics and Astronautics (AIAA) Design-Build-Fly Competition. 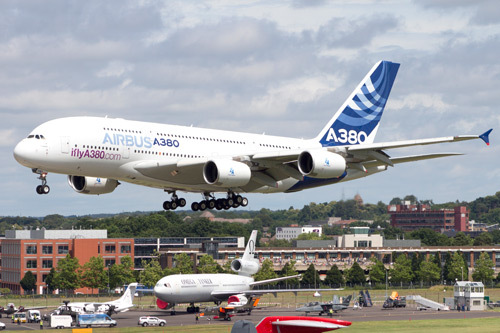 City’s Aeronautics Research Group is substantially engaged with the Aerospace Technology Institute and has attracted £2m in research and development funding from them over the past three years. Professor of Aerodynamics, Chris Atkin, is currently President of the Royal Aeronautical Society (RAeS). A wind tunnel is a tool used in aerodynamic research to study the effects of air moving past solid objects. A wind tunnel consists of a tubular passage with the object under test mounted in the middle. Air is made to move past the object by a powerful fan system or other means. The test object, often called a wind tunnel model is instrumented with suitable sensors to measure aerodynamic forces, pressure distribution, or other aerodynamic-related characteristics.